I’ve got to get something off my chest. My last predictions had some flaws in them, and I apologize. Regardless, I still have four of my six predictions alive, and 4/6 equals 2/3 which is two times 1/3 which happens to be the number of predictions Blase got right in last weeks round of playoff games (Boom). Because of this, I strongly advise you to read this over Blase’s predictions. So, for this round of playoff games, I thought I’d bring in my expertise and give you a proven experts opinion on these games. This game has quite the odd vibe to it. On one hand, you’ve got the Patriots who had an extremely impressive win against the Broncos and on the other, you’ve got the Ravens who struggled to get by the Texans who was quarterbacked by T.J. Yates. Based on conventional wisdom, one should conclude that the Pats should win, but conventional wisdom is often predictable and under thought. So, I compare the thoughts of the average sports fan with my thinking. Conventional thinking: Wow, this is not going to be a game. God’s nephew vs. T-Sizzle? T-Sizzle, wait a minute, isn’t that Taylor Swift’s rap name? I mean God’s nephew did make the Mile-High Messiah look like Harold Camping (the guy who predicted the world was going to end last May), so Brady will probably make Flacco look like some hillbilly with a hideous Fu Manchu… oh wait. On top of all that, they’re playing in Foxboro, which makes the Ravens chances of succeeding similar to Charles Barkley’s chances of losing weight. The only thing shocking about this matchup is that the Patriots are only 7 point favorites. This will be a blowout. My thinking: Wow, this is going to be a great game. God’s nephew vs. T-Sizzle… Ray Lewis, Ed Reed, Haloti Ngata, Cheeseburger (Ngata’s nickname for Terrence Cody) and, of course, Ray Rice. Brady has put this team on his back for so long that he probably has some form of chronic back pain that I’m sure one of the Ravens’ defensive menaces will bring out by the end of the game. The Pats may be 13-3 this year, but they haven’t beaten anyone with a winning record all year (even the Broncos finished 9-9). They only played two playoff teams (besides the Broncos, but their hardly considered playoff caliber) during the regular season (Giants and Steelers) and lost them both. Also, their defense is awful. People (including Ed Reed) have been giving Flacco beef all week for his inability to score against the Texans last weekend, when really no one has been able to score on the Texans all year. The Texans have given up the 4th fewest points all year only behind the Ravens, Steelers, and 49ers, and only 12 points more then the Ravens. I still don’t think the Ravens will light up the Patriots offensively, but I can easily see them scoring over 30 points which will be more then the Ravens are going to give up to the Pats. Last weekend, I sat down to watch the Packers-Giants game in my basement and something felt really out-of-place. It was a similar feeling to watching Two and a Half Men with Ashton Kutcher instead of Charlie Sheen. I knew something was up and then when the Packers kicked that onside kick in the second quarter, it all clicked. The 15-1 Packers, and #1 seed in the NFC, were playing like they were underdogs. Onside kicks in the second quarter are only acceptable in two situations: a) you’re trying to surprise a team that has been called better then you by everyone all week(i.e. the Saints vs. Colts in the 2010 Super Bowl) or b) you’re clinically insane (there are still no examples of this occurring in the NFL). After doing some research, I figured out that Mike McCarthy isn’t insane and that the Packers were the favorites in the game, so it wasn’t any of those situations. But I thought some more and can now say that the Packers kicked an onside kick because Mike McCarthy is kind of insane and people were kind of saying the Packers might lose. As a result, the Giants were able to beat the former world champions without much of an effort. To most, this was a very convincing win, but to me it just didn’t seem right. The 49ers, on the other hand, had a very impressive win last weekend. Alex Smith finally looked like the Steve Young that everyone expected him to be as the #1 draft pick back in 2005. On top of that, they beat the Saints, the team that I predicted to win the Super Bowl. Going in to the playoffs, we all knew that the 49ers could play defense. All they needed to become Super Bowl contenders was solid play from Alex Smith, and I saw more than that last week. In the end, I think the 49ers win this game because of the other Smiths, Justin Smith and Aldon Smith on the defensive line. These two feed of the success of the secondary and likewise for the secondary. If the secondary, lead by sudden stud in Carlos Rogers, is blanketing the Giants receivers, you know one of the Smiths will get to Eli, whereas if the Smiths apply pressure on Eli, their secondary is more then capable then picking off a hurried throw. Because of this, I give the edge to the 49ers. This entry was posted in Football, Home, National, Uncategorized and tagged 49ers, Giants, NFL, Patriots, Playoffs, Ravens. 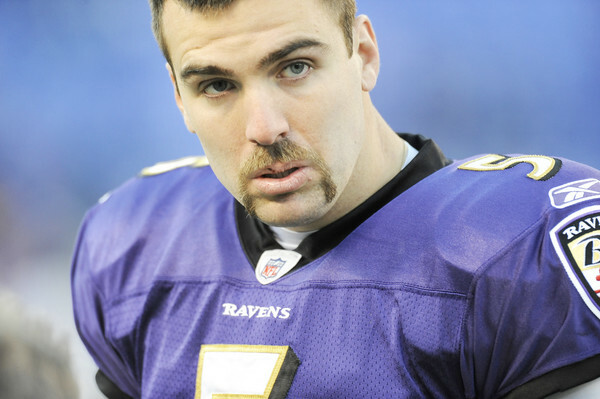 Flacco’s mustache makes him look somewhat like a young “Ron Jeremy” . Should be a great spectacle either way . Ravens and 49ers would supply more defense than the Joint Chiefs could ever dream up. The “Family Feud” Super Bowl would be a media frenzy that is for sure… I really cannot remember a more wide open Championship Sunday. Can’t wait!!! Good picks. I am with you on the 49ers to. I think the 49ers have something special going on and the Giants offense isn’t the Saints. The Giants beat a mediocre Packers (based on one game) vs. the 49ers beating a very hot Saints team.